The estimated cost of corrosion in the electric power industry is in the region $20 billion, representing about 8.0% of the cost of electricity to consumers in the United States. About 22% of the corrosion costs were considered avoidable. 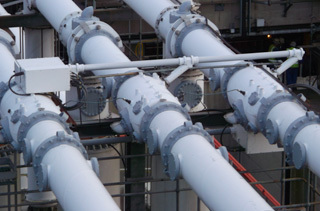 As processes for power production become more varied and inventive with the use of harnessing natural resources such as Geothermal and hydro elctricity production, wind farms, wave/tidal energy recovery, solar energy recovery, etc, the geographic situation of these facilities have meant that corrosion and contaminents are having a large effect on the cost of production. As an example offshore windfarms are exposed to constant salt water and salt mist causing corrosion of moving and servicable metal parts, thus reducing the operational efficiency and longevity of the installation. Oxifree metal encapsulation and anti-oxidizing propoperties will enable a greater economic return from energy production by extending serviceable longevity of metal parts such as bolts, flanges, inspection panels, bearing housing, hatches, hinges, valves, etc. Oxifree will not only shield against corrosion but also protect against ingress of dust, pollen, mud, sand/grit and moisture.